Last week, I blogged about my favourite projects, inspired by the 30 Day Challenge, created by Knitting in Wonderland. It was hard to pick my favourite project that I’ve completed over the 5+ years I’ve been knitting, but when Knitting in Wonderland asked on Day 7 what is your least favourite project, I didn’t hesitate. Blogisphere, meet the Moon Socks. Okay, context. Yes, the finished slippers look great, and my sister loved them when I gave them to her for Christmas 2013, but when I gave them to her, I swore I would never make that pattern again. I downloaded the free pattern (here’s the link to my project page, but don’t say I didn’t warn you). 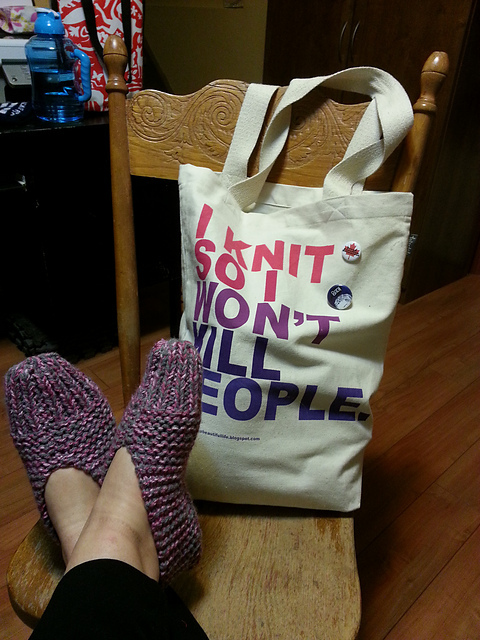 I started knitting. Perhaps it was my inexperience, still relatively new to knitting in the round, still learning to become fluent in knitting pattern lingo, but as I knit all I could think of is how terrible of a written pattern it was. Picking up the stitches for the foot was one of the worst things I’ve had to muddle my way through, and as I knit, I found that I was constantly checking lengths against my own foot because the lengths they suggested/rounds to repeat didn’t work out. If any good came from this project, besides the intended recipient loving her slippers, is that because of this project, I started my faithful habit of my knitting journals. My journals are a kind of scrapbook/smashbook that I cut and paste patterns in, use to take notes as I’m knitting along, or I keep notes on patterns I’m improvising on the fly. I had to keep notes while making these (insert negative adjective) slippers, and the habit has stuck. Three journals later, and I have found them to be an irreplaceable resource to me. I’d be lost without this journal! So there you have it. My least favourite project: the Moon Socks. For my grandparents, their gifts fall into Short and Sweet category. Grandma asked for a pair of fingerless gloves (as they keep her hands warm while her fingers are still free), and Grandad received a watchman’s cap (or as Grandma asked for, “a hat that won’t make your grandfather look like a pixie and stick up on his head”). Both of these projects knit up very quickly. I love the yarn I used for both – Grandma’s mitts were made with Berroco Ultra Alpaca Chunky, and Grandad’s hat with Berroco Ultra Alpaca. Apparently I was in an alpaca mood for my grandparents, but then, how can you not love alpaca? The mitts are the Fast and Fearless Fingerless Mitts, a pattern that truly lives up to its name, and the hat is ChemKnit’s Generic SkullCap. This is the same basic hat as Brother’s Argos hat, and I love the way the top finishes with a swirl, so I knew it would be a great pattern for Grandad. I modified mine by making the ribbing longer so that it could have a folded brim. My best friend has twins, and I love being able to shop for gifts for them. It’s so much fun buying clothes and toys for mini-humans. She said that they needed PJs, so PJs they received, but what set of PJs would be complete without matching slippers? I didn’t get pictures of them, but I made the twinkles each a pair of Aunt Maggie’s Slippers in colours that would match their new jammies. I’ve made the adult sizes countless times, and the child sizes came together surprisingly fast. The last project I’m featuring in this Short and Sweet round-up is the scarf I made for my mother. It technically isn’t a short and sweet project because it was in the works for a month and a half, but besides loving the pattern and loving the yarn, there isn’t much to remark about it. The pattern was compliments of a yarn company based in Mississauga, Dye Version, after I bought two skeins from them at the Toronto Knitter’s Frolic, and the yarn was bought in Waterloo during my day there with my sister. It’s Cascade Yarns Avalon Multis, a lovely sturdy cotton, and as soon as I saw the colours I knew this yarn was destined to be something for my mother. She loved the scarf, loved the cotton, and as I intuitively knew, she loved the colours. Because, Really, Who Likes Cold Toes? Since knitting my first pair of slippers, I’m hooked (and please pardon the unintentional crochet pun!). There is nothing quite as comforting as warm toes inside thick, squishy handmade slippers. Since moving back with my parents a few years ago due to changes in my personal life (a long story not to be told today), I have managed to wear through at least 3 pairs. They have hardwood/laminate throughout, and slippers are a lovely comfort. The ball of the foot is the first to go, and after that I find I must say goodbye to these beloved accessories. 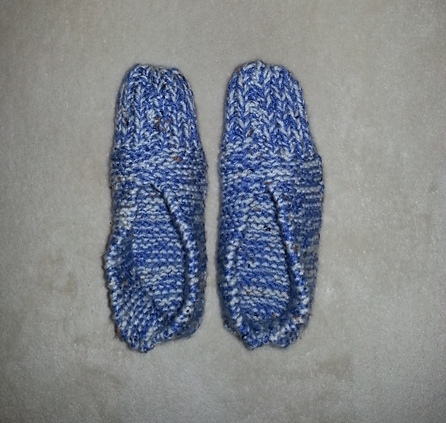 My go to pattern is Aunt Maggie’s Slippers, knit with two strands. My first pair was made with only one strand, and I found they just don’t have the sturdiness that comes from two strands. I have since made 6 pairs – four for myself, and two for family. What has been the most fun for me with this pattern are the colours, trying to decide which two colours will work well together! Blue/tan, pink/grey, purple/grey, black/black and white variegated, the combination possibilities are endless! I’ve had to remake the beloved slippers a week or so ago after wearing through yet another pair. This pattern is knit flat, which means sewing up the toe and heel. It’s around this point that my laziness and ability to grumble kicks in, and so, even though I’ve JUST made a pair, I began to cast on another pair. This time, I started knitting flat, but once it measured 4″, I switched to DNPs, so that the toe will be knit as one, therefore no sewing! The heel still needs seeming, but I’m looking at the toes as being a victory. I’ve recently learned that in Quebec, it is a custom to have a basket of slippers by the front door, encouraging guests to remove their outer shoes (not many Canadians wear shoes inside anyways), and to wear slippers to keep your feet warm and cozy. There is something so quaint and charming about this idea. Once I buy my very own home, which is the plan once one is available in my price range, I will be adopting this idea and welcoming guests with slippers to warm their feet because, really, who likes having cold toes? Author LTerechPosted on January 26, 2015 January 23, 2015 Categories KnittingTags knit, Knitting, slippers3 Comments on Because, Really, Who Likes Cold Toes?